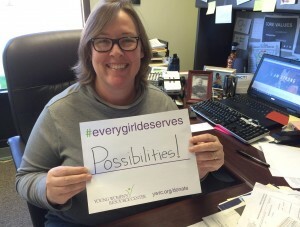 Every girl deserves a life of possibilities. That is what we believe in at the Young Women’s Resource Center. While we would like to believe that sentiment is held in high regard by all, it has certainly been challenged recently. Many of our basic assumptions about what is right in our country have been confronted. So how will we respond to this challenge? With never-ending support of our girls and young women through advocacy, education and empowerment. We all have the power to ensure that every girl in our lives understands that she is valuable. We have the power to attack statements that value girls and women based on physical beauty or as sexual objects. We can raise our voices when girls and women in our lives are denied leadership opportunities solely due to their gender. We can find creative methods to unite to support girls and women in our community. Our community is strong and vibrant when we build up all of our citizens. Find your voice, find your passion and find a way to ensure that every girl in the greater Des Moines area has a life of possibilities. Volunteer, participate in community dialogues and support agencies like the Young Women’s Resource Center so that all girls and young women can be strong, self-confident and successful.